Figure 8.25 Shotgun pellet patterns: (A) contact to 2 ft, (B) 3 ft, and (C) 4 ft.
pattern of the fatal wound on the body. It must be stressed that identical weapons of the same choke may produce different patterns; thus, the actual weapon employed in a killing must be used. A fact not often appreciated is that ammunition plays a great part in the size of the pattern. Different brands of ammunition, even when loaded with the same shot size, produce different patterns at the same range. Another factor often not considered, and that can cause errors in range determination, involves the measurement of the shot pattern on the body. Different individuals measure the same pattern differently. The occasional flier should be ignored, and only the main mass of the pellet pattern should be measured. Figure 8.26 Shotgun wound of chest with scalloping of margins (range, approximately 3 ft). At close range, when there is only a single large wound of entrance, the wad from a shotgun shell will be found inside the body. If the shell contained a plastic Power-Piston® wad or plastic shot cup, as the wad enters the body, the individual arms or "petals" that have peeled back in flight may produce a patterned abrasion around the wound of entrance (Figure 8.29). These petal marks can occur even if the entrance site is covered with clothing. Figure 8.27 Entrance wound with scattered satellite pellet holes (range, approximately 4 ft). Figure 8.28 Slightly irregular wound of entrance surrounded by pellet holes (range estimated at 5 to 7 ft). In 12, 16, and 20 gauges, one will have a circular wound of entrance in the center of a Maltese Cross abrasion. In .410 gauge shot cups have only three petals; thus, three equally spaced rectangular abrasions radiate from the entrance rather than four (Figure 8.30). 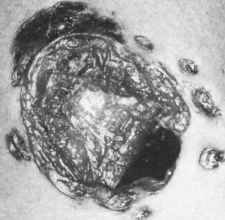 Figure 8.29 Intermediate range 12-gauge shotgun wound of abdomen with "petal" marks from Remington Power Piston® wad. 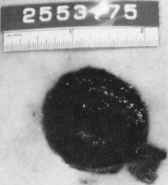 Figure 8.30 .410 shotgun wound of chest. Note the three equally spaced "petal" marks characteristic of the .410.
is bare. Petal marks are seen at rangesbetween1and3ftfor12, 16and20-gauge shotguns. Before 1 ft of range, thepetalsusuallyhavenotopenedup sufficiently to mark the skin. By one foot, they willhave. Theincreasingair resistance bends the petals back so thatafter3fttheyaregenerallyflush with the sides of the wad base, and no petalmarksareproduced. Sometimesnot all the petals bend back uniformly, and one finds a circular wound of entrance with only one petal mark (Figure ). In.410shotguns, thepetalmarks appear at 3 to 5 inches (7.5 to 12.5 cm), reachamaximumspreadat12 to 2 1 inches (30 to 52.5 cm) and disappear at approximately 2 ft. (60 cm). Dowling et al. attribute the earlier spreadof the.410petals totheirlong, narrow configuration. As the range increases, the wads graduallyfallbehindandseparatefrom the main shot mass. At relatively close range, thewadmayimpacttheedge of the entrance before sliding into thebody. Thus, one willhaveacircular entrance surrounded by a symmetric abrasion ring with a large, irregular area of abraded margin on one side wherethewadimpacted. Asthe range increases (5 to 8 ft), however, the wads will drift laterally until they impact on the skin adjacent to the entrance site and do not enter (Figure 8.32). At this time the wad will leave a circular or oval imprint on the skin. In shotgun shells loaded with both an over-the-shot wad and a plastic shot cup, one may get two sets of wad markings. As the range from muzzle to target increases still farther, the wads will miss the body or strike with so little energy that they will not leave a mark on the skin. The maximum range out to which wads will produce patterned abrasions on the body is unknown. Filler wads have produced marks at least out to 15 ft, and plastic wads out to 20 ft. 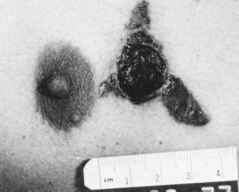 Figure 8.31 (A) 12-gauge entrance wound of chest with single "petal" mark. (B) Plastic wad falling behind shot. Note that three of the four petals have folded back, with one still protruding. In some instances, for unknown reasons, the shot cup or Power Piston® does not open to release the shot. Thus, the mass of shot travels to and through the body in one compact mass. In the case illustrated, this happened to a limited degree (Figure 8.33). Most of the pellets stayed in the Power Piston® and exited with it. Some pellets, however, did emerge from the wad as it moved through the body. Figure 8.32 Circular abrasion of skin from composite wad. Figure 8.33 Perforating shotgun wound of chest. Note the small number of pellets present. The circular mark in the upper left-hand corner of the picture indicates where the pellets entered. target was aluminum screen, window glass, thin cardboard (3 mm) or cowhide (3 mm). Tempered and safety glass, 1/8" masonite and 3/8" fir plywood increased pattern diameters 2-3 times. If an intermediary target is of sufficient thickness to cause dispersion of pellets prior to striking an individual, estimates of the range from the pattern on the body will be erroneous unless the effects of the dispersion are taken into account. The only way to determine the range correctly is to interpose a similar intermediary target when test firing. 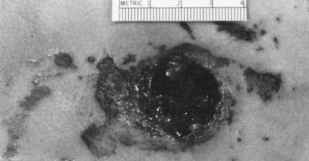 While the effects of an intermediary target on pellets is obvious, less so is its effect on the appearance of a wound when the missile is a shotgun slug. Thus, in the case of a young boy accidentally shot with a 12-gauge slug, his hand — specifically, a finger — acted as an intermediary target. The slug fragmented the bone and soft tissue of the finger, propelling it against the deceased's chest, where these fragments produced irregular areas of abrasion (Figure 8.34). Figure 8.34 Entrance wound of chest from 12-gauge slug. The irregular abrasions around the entrance are due to fragments of the victim's finger. In another unusual case involving an intermediary object, an individual was shot with birdshot, at a range of a few feet, through a pillow, with a 12-gauge shotgun. There was a single large entrance wound of the side of the chest, without satellite pellet holes, but with a wide irregular band of abrasion. A large clump of filler material from the pillow was recovered from the entrance in the chest. 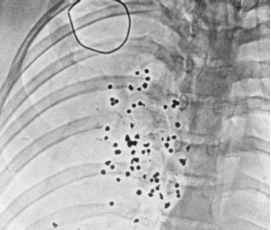 Internal injuries, due to shotgun pellets are extremely variable, depending on the range at which an individual is shot. 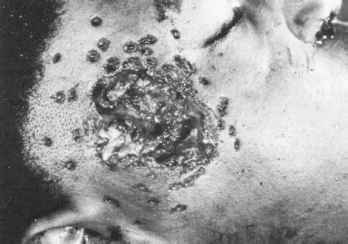 In contact wounds, where one is dealing with the effects of both the pellets and the gas, there may be near disintegration of organs. 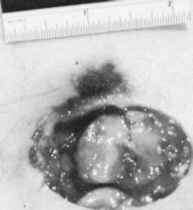 Close-range wounds, in which the pellets enter in a relatively compact mass, can also result in pulpification of organs. 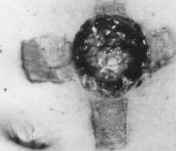 As the range increases, and the pellets enter the body separately, the wounds produced will resemble those from a low-velocity handgun bullet. Perforating wounds of the trunk from shotgun pellets are uncommon. When they do occur, they usually result from a superficial perforating wound; contact wounds in an extremely thin person, and contact or close-up wounds from shells loaded with buckshot. The wound of exit may vary from a large, irregular, gaping wound caused by a mass of pellets exiting to a single slitlike exit wound produced by one pellet. Only very rarely will one see exit wounds of the trunk from a direct hit with birdshot. 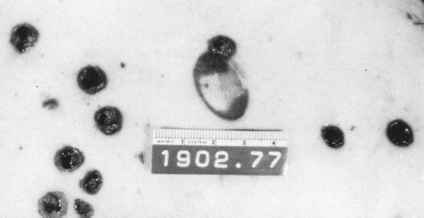 Such cases may be due to the welding together of a number of pellets at the time of firing so that these pellets move through the body as a single mass. In all shotgun deaths, the size of the pattern on the body should be measured and recorded. Photographs of the wound pattern are recommended. These can be used for subsequent range determinations. Shot and wads should be recovered and retained. Examination of the wad will give the gauge of the shotgun and make of the ammunition. Measurements of the pellets will give the pellet size. On rare occasions, irregularities at the end of the muzzle will impart scratch marks on plastic wads that are sufficiently distinctive so as to make positive ballistics comparison between the wad recovered from the body and a test wad fired from the suspect weapon. Such cases usually occur when the barrel of the shotgun has been sawed off, leaving jagged metal projections into the barrel. Such comparisons are also possible with the plastic sabot of shotgun slugs.